The starting point of an outstanding cedar homes package is always design. The cedar home design you choose determines the look and the basic structure requirements of your custom cedar home. In turn, this impacts many of the other activities involved in successfully completing your cedar home plan project. At Cedar Designs, we offer an extensive library of hundreds of existing cedar home plans and post and beam home designs that can be customized as much as necessary to meet your needs. We are also happy to take your ideas and work with you to produce a unique cedar homes design solution. With the expanses of windows, elegant doors, peaked roofs, and columns crafted from the finest wood or stone, prefabricated cedar homes have a unique curb appeal. Our prefabricated cedar log home designers can include features to make your bedroom a personal retreat. Whether you want a one-of-a kind master suite with sky-wall, or just a better way to plan shelving, lighting and sleeping space, we have the expertise to make your bedroom a place of pampered perfection. Award-winning kitchens that have become the heart, and also the pride, of many custom cedar homes. The planning of the kitchen is paramount, making the central entertaining and gathering area a showcase, while ensuring that it remains both functional and accessible. The Zen-inspired spirit of the spa can be found in the bathrooms offered by Cedar Designs. The abundance of wood instills comfort and serenity, while natural light, high ceilings, and such welcome amenities as walk-in showers and deep soaking tubs help soothe away the stress of the day. 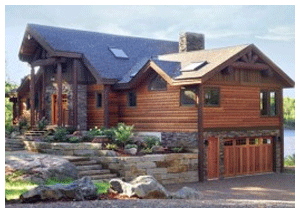 Building a custom cedar home is an involved process. Making an informed decision is not easy.